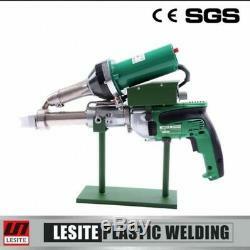 Handheld Hot Air Plastic Extrusion welding machine Extruder Welder Gun LST600A. 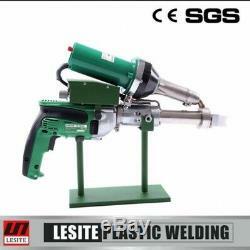 This machine come with green shell original Switzerland 1600w hot air gun and. The extruder gun motor is 800W using. 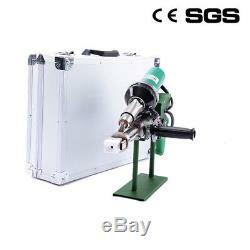 This plastic extrusion welder that has functions of double independent heating systems, digital display controller. 360-degree rotating welding head, motor cold start protection, which is applicable to welding PE, PP, PVDF and other hot melt materials. This welder start to weld when the temperature up to 270°c. 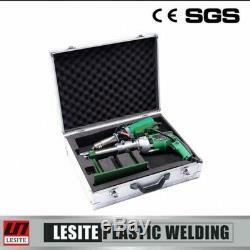 This welder is welded with PE or PP welding rod 3.0-3.5mm. Any customized demands, you can ask us directly. We have professional technicians team. Easy to handal and is availbale to many places etc. 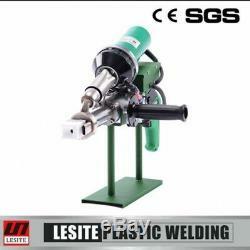 Lesite Handheld Extruder LST600A is used for weldng PE, PP, PVC, PVDF, membrane, tank, and so on. This tool is of light weight, stable performance, convenient operation. Large-amount extrusion and high efficiency, the advantage is for welding narrow gap and corners where is not easy to reach. Have a digital display controller. Independent heating systems of welding rod and membrane material. 1600w CE approved hot air blower and 800w welding rod heating system. How to solve the technical problems? --We have one professional technicians team who can solve problems. We can send most of our products to worldwide. Europe : UK, Germany, France, Ireland, Norway, Sweden, Greece, Spain, Denmark, Finland, Switzerland, Belgium, Austria, Malta. Oceania & Asia:Australia, New Zealand, Indonesia, Philippines, Thailand, HongKong, Macao, Japan, Korea, Malaysia, Singapore. Turkey, Israel, United Arab Emirates, Cyprus, Brazil, Mexico, Argentina, Bulgaria, Estonia, Hungary, Czech Republic, Russia. Thank you for your understanding. We strive to answer all questions and resolve any problems as quickly as possible. Mon-Thu 8:00-5:00 ET. Fri 8:00-3:00 ET. If you have a question or concern before or after receiving your item, please do not hesitate to contact our customer service team by clicking on the. E-mails are answered Monday through Saturday. Please allow up to 48 hours for a response to your message. Rest assured all customer inquiries are a high priority and will be responded to in a timely and professional manner. Your satisfaction is our guaranteed. 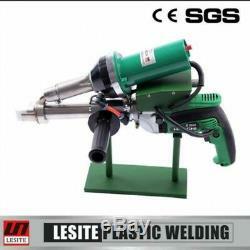 The item "Handeld Hot Air Plastic Extrusion welding machine Extruder welder Gun LST600A" is in sale since Tuesday, November 14, 2017. This item is in the category "Business & Industrial\CNC, Metalworking & Manufacturing\Process Engineering Equipment\Plastics Equipment & Supplies\Auxiliary Process Equipment\Plastic Welders & Sealers". The seller is "biz-blooming" and is located in Fast delivery. This item can be shipped worldwide.